Savour the flavours of a British autumn with delicious tree fruits and berries, nuts and spices in this family-sized dessert. It makes a great addition to the Sunday dinner table. 1. Place 1–2 tsp of the melted butter in a saucepan, add the sugar and cook for a few minutes, stirring until starting to turn golden. Add the fruit, spices, nuts and cranberries and cook for 10 minutes until tender. Turn off the heat and leave to cool completely. 2. Preheat the oven to 200ºC, gas mark 6. Lightly brush the sheets of filo pastry with melted butter and lay on top of each other to give a 48cm x 26cm rectangle. Spoon the fruit mixture along the short side. Fold in the edges then roll to enclose the filling. 3. Carefully transfer the strudel to a large, non-stick baking sheet. Brush with a little more butter and bake for 25–30 minutes until golden and piping hot. Cut into 6 slices and serve with a dusting of icing sugar. 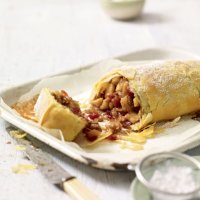 Make the strudel up until the end of step 2 and chill (for up to 24 hours) or freeze (for up to 1 month) until ready to bake. This recipe was first published in Thu Aug 27 09:12:00 BST 2015.